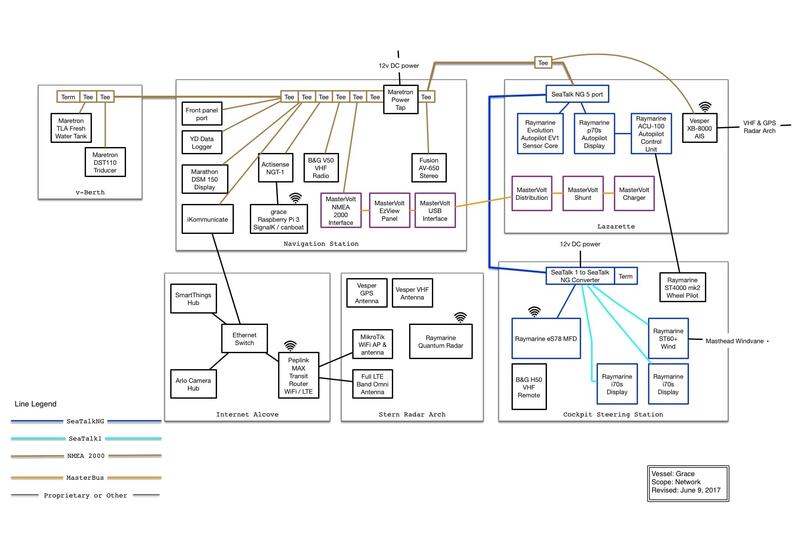 I originally posted a fairly lengthy article outlining Grace’s integrated network about a year ago, but it is a work in progress and constantly changing. There have been some updates that I wanted to cover which will help the network continue to grow and expand, as well as fixes for problems I found. I’ve updated the network diagram to include the changes as well as more detail on the Internet Alcove and the new Radar Arch. There were several problems with the 2016 design which caused reliability and accessibility challenges. Accessibility – the majority of the NMEA 2000 network was behind the navigation station panel where all the instruments are mounted, which required removing it every time I had to work on the network. This caused lots of extra work to be able to unscrew and carefully remove the panel without tripping breakers, pushing buttons, or damaging anything. I am currently in the process of designing a new panel using Front Panel Express which will condense all of the devices, swap out the factory electrical panels with more compact BlueSea solutions, and hinge the whole thing for ease of access. This isn’t 100% done yet, but it is one of the top things I am changing. Squished – I used standard NMEA 2000 taps off the backbone in this area, and by the time I made it through the 2016 season, there were too many back-to-back to fit in the space! Power problems – the dual power setup I discussed in Grace’s integrated network was causing headaches and major reliability issues, with parts of the bus unable to see the other devices at random times depending on what was powered up when. Removal of dual power sources – instead of powering things for the “always on” part of the network from the Maretron tap, and the rest of the devices from the Raymarine tap at the helm, I now have one power source – the Maretron tap. This means that everything goes on all at once, but it has solved the weird power fluctuations and device disappearing problems. I liked having a section of devices that I could leave on all the time and access remotely, but the weird interactions caused outages during navigation which were dangerous. To achieve this same result, I can manually power down individual instruments and leave others on, with the exception of things like tank sensors and depth transducers. 4 port connector block – I purchased three of these to add to key parts of the network – two for behind the navigation panel. I considered a version from ActiSense, but they are hard to find and expensive. I also considered the ActiSense QNB product I used on Jammy, but it had too few ports and was a bit bulkier than I’d like. I may still do this later this year and move some taps around as I like having a single device for the drops and the power, all integrated and sealed. iKommunicate – this was added last year shortly after the network was updated and I did a review of the product. It has become one of the primary ways I get data off the network on a smart phone or tablet. 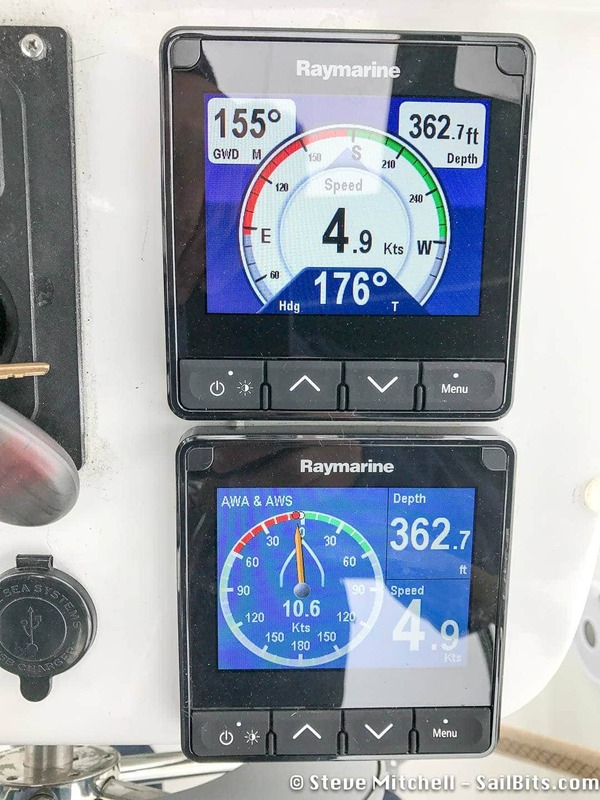 Depth/speed/temp – the old Raymarine ST60 speed sensor started failing late in 2016. I replaced the depth sensor (the speed sensor is a funky non-standard size) with a Maretron DST110 smart tri-ducer which includes depth, speed, and temperature. This is a no brainer for anyone with a NMEA 2000 network needing to update/replace any of those three sensors. Pretty much plug and play as long as you have a NMEA 2000 tap nearby. Raymarine i70s / p70s instruments – as part of the depth sensor change out, the old ST60 instrument at the helm stopped working since it was reliant on dedicated wires providing the data to the unit from that sensor. Thankfully, even after 15+ years, the holes for the ST60 are identical to the new Raymarine i70s, so replacing them was pretty easy. I chose to hide the ST60 wind instrument under the helm, as it is still gathering data from the mast mounted instrument and transmitting it onto the NMEA 2000 network via the Seatalk1 converter. Eventually I want to replace the masthead device with a NMEA 2000 or wireless solution. The i70s are a leap forward compared to the old ST60’s of course, and it is nice to be able to display all sorts of different info depending on the “mode” that the boat is in – navigating, docking, anchored, etc. – instead of static displays. I have configured lots of different data panels depending on these modes, and love the visibility they provide. I also replaced the autopilot head with the p70s to make all three instruments consistent in look and software. The autopilot head has some minor updates from the original but otherwise is pretty close. SmartThings – this was added to help manage temperature and security and I covered it in SmartThings keeps the boat warm during winter. It required a connection via ethernet to the internet. Arlo Security Cameras – this was just recently added, and I’ll write more about it soon. Like the SmartThings hub, the Arlo hub requires an ethernet connection to the internet. I really wish manufacturers would go away from this, but I understand that for security and such you would want reliability. Radar & Radar Pole / Arch – this was a big project which I still plan to write about very soon. I added a Raymarine Quantum radar on top of a Garhauer radar pole and arch. It sounds so simple when said that way, but the planning and execution for the pole installation was quite intense. There were a lot of cables from other devices mounted on the arch, and things that had to shift around to make everything work. The radar itself is a fantastic addition to have for visibility, and has come in handy on several trips already. 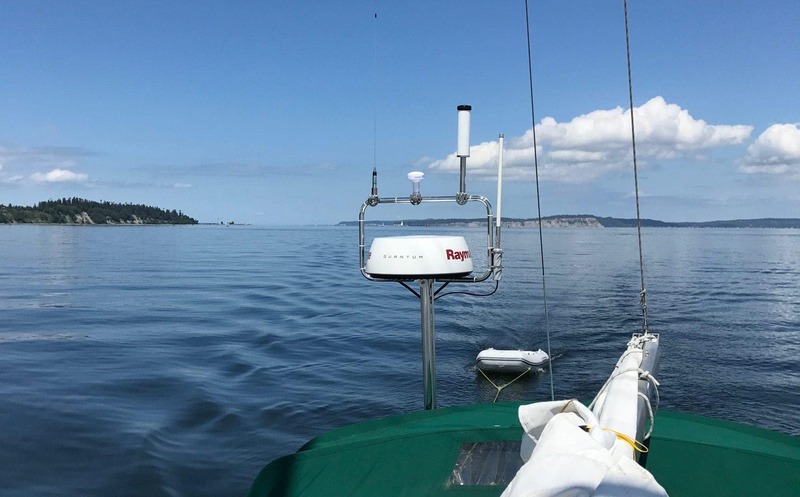 Vesper AIS move – prior to heading up to the San Juans in this year’s first longer trip, I had to move the Vesper AIS. This was partly because I was having problems with my VHF radio and removed the splitter I had put in place last year as a temporary solution. I also wanted a dedicated VHF antenna like I had on Jammy, and was able to do this with the new radar arch. I have seen significant improvements in the quality of my AIS antenna signal as a result of a dedicated, properly terminated antenna. The next big change is the installation of a Raymarine Axiom chart plotter, and a B&G Vulcan 5 chart plotter (more of an instrument given the size) at the helm. This requires a new NavPod shell, and moving some things around including the H50 wireless radio. There are a few other small projects I have planned for the rest of the year such as adding a display in the main stateroom so I can see random data when awoken at night, a new tank sensor for the waste tank and maybe fuel tank. Raymarine Axiom and Lighthouse 3 review and first impressions. A fantastic upgrade to Raymarine's software, with excellent hardware supporting it. Still some work to do with the software. First long trip of the year included testing out a lot of new gear, as well as a scary 12 knot passage through Cattle Pass. All turned out well, and a visit to the San Juans was just what we needed.